This weekend, DIY storefront art space Cleopatra's in Brooklyn will be hosting an exhibition for Billy Rennekamp's WIN WIN. The event kicks off tonight with a talk on video games and cheats hosted by designers/writers Charles Pratt and Simon Ferrari. This exhibit is an extension of Rennekamp's BA thesis project at Bard, titled Big Head Mode. 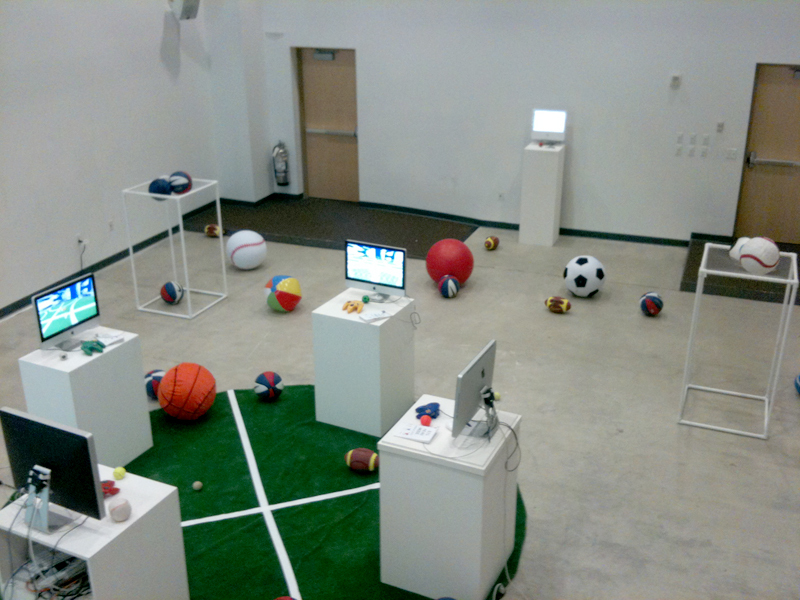 Focused on the idea of cheats in video games, and especially the agency yielded by the use and development of cheats in game play, the works in this installation comprise a 3D video game made by the artist, a prepared version of a Pokemon ROM, and a mix of hand sewn and store-bought sports balls littered throughout the space. In anticipation of the show, I conducted a one question interview with Rennekamp, à la Rafael Rozendaal's One Question Interview blog. What makes cheats so satisfying? We spend our life building up this little rule book that describes how everything works. So when we see something that defies these fundamental rules, we freak out. The unusual and unexplained are always fascinating. Things are supposed to work a certain way. They've worked that way forever. But then they stop and the rules might bend or even break. When that happens a special energy is produced. Every time something rare occurs--something outside the ordinary--people make wishes and try to harness that power. Needless to say the power is felt. When I was three I got bitten by a Brown Recluse. My arm was swollen with pustules for weeks and the necrosis on my hand left a permanent scar. There's nothing beneficial about a scar, but I still feel like I gained something. I got some of that weird energy for being chosen by the spider and included in the event, even marked permanently for it. When these events occur by accident it is a glitch or a miracle; gumballs keep rolling out of the machine. But when someone can create them on purpose it is a cheat. Cheats are the intentional tampering with the laws that govern the world around you, whether that world is your life or the game in which you're immersed. Someone wielding cheats lives by a different set of rules and restrictions from everyone else--even though they're still firmly planted in the same world. Cheats are satisfying because they give you magical powers.